I would like to say that I invented this salad but I flat out ripped it off. Because when I eat something delicious in a restaurant my first thought isn’t “wow, this is so good I’m just going chew slowly and live in this amazing moment” but rather “can I replicate this at home?” I have a long way to go in my zen practice of present-moment awareness. This particular dish was pilfered from the wonderful Beatrix restaurant, part of the Lettuce Entertain You group. 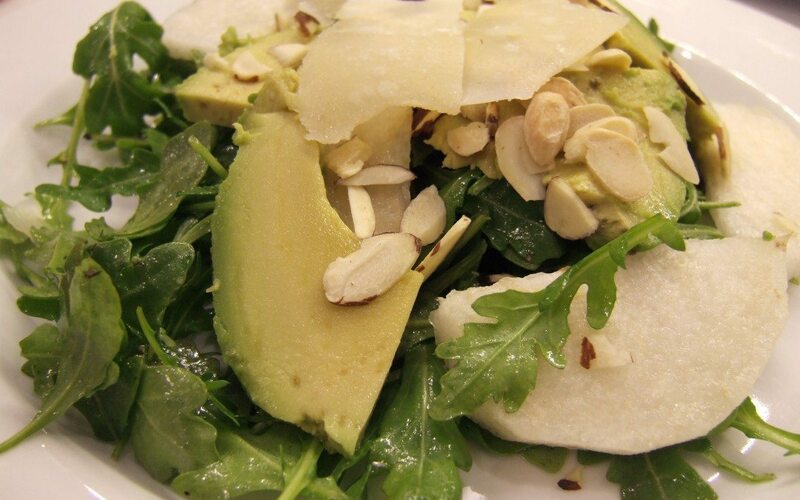 They call it the Straight A Salad to reflect the fact that it’s composed of arugula, asian pear, Asiago and almonds. Unfortunately for them, by giving it this mnemonic name they made it super easy to steal. Suckers! For the dressing I just use the classic 3:1 ratio of oil to vinegar and use whatever fruity type vinegar I have on hand (currently pomegranate) but you can use any flavor. And here’s a very hand tip from Cook’s Illustrated: to be able to peel and slice the pears up to 24 hours ahead, just dip the slices into a mixture of 2 tablespoons honey and 1 cup water, for a mere 30 seconds. Works with apples too. I have made this so many times for dinner parties that I am seriously thinking of creating a spreadsheet to make sure I don’t serve it to the same people three times in a row.